Owned and by a former athletic wear executive and his two sons, this family operation is both locally grown and internationally connected. Driven by the promise of community, the folks at Feetures! are old-school about their customer service. Among their touted values, you’ll find Accountability, Quality and Sustainability. They seem to be well aware that as producers of outdoor wear, they need to be especially aware of the environmental impact of production. Consequently, you’ll find their packaging to be 100% recyclable and printed with soy-based ink. Additionally, a portion of every sale goes to the National Forest Federation, an organization dedicated to preserving natural environments throughout the country. With this kind of commitment to their surroundings, it’s little surprise that the folks at Feetures ! are masters of customer satisfaction. Perhaps it’s inherent given the multi-generational dynamic. Nevertheless, you can expect clear, honest and transparent conservation when asking questions about your socks. Needless to say, these guys guarantee their socks for life. Despite their traditional general store vibe, these folks are just as serious about innovation. Allied with suppliers throughout the world just to ensure they can access every type of material, Feetures ! is constantly flirting with perfection and the unknown. 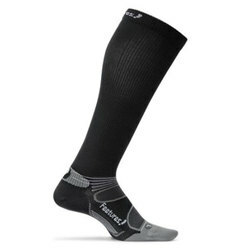 Endowed with Iwick Nylon, Polyester and Lycra Spandex, these socks repel invasive moisture while providing a veritable featherbed for your feet. Designed for every outdoor enthusiast, (be you trailblazer or tennis player) these socks are simply vessels for pain-free comfortable excursions. With Feetures! you’ll never encounter a sock that hasn’t been meticulously designed or rigorously tested. Because they don’t engineer shoes or boots, they can concentrate on the fabric that fits inside them. While sock innovation may seem like an odd joke, wait until your toes curl up inside a pair of Feetures! You’ll marvel at the protection they offer and how well they perform through a marathon of activity. Combine Simplicity and Adaptability and sprinkle in some tasteful design, and you’ve got the recipe for every sock in the Feetures! catalog.